On an inflorescence of Velvet Mesquite (Prosopis velutina) in the New River Mountains north of Phoenix, Arizona, 11 May 2014. 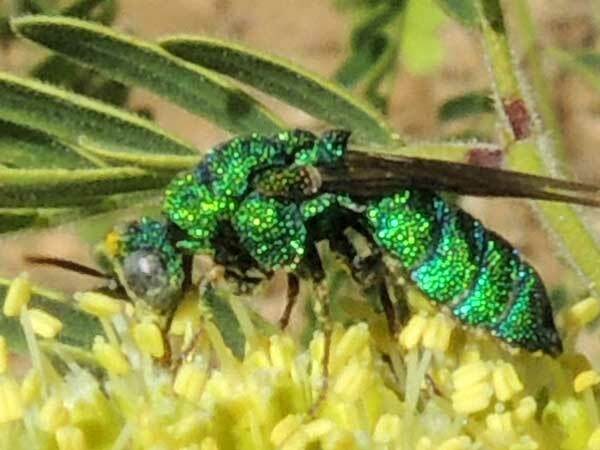 One could imagine that the name Cuckoo Wasp was applied because of the gaudy emerald punctures covering every surface. However, like cuckoo birds, these insects place their eggs in the nests of other insects, primarily other bee and wasp species. The young cuckoo larva feeds on the host and/or its stored food, thus killing it. Bug Eric - a Must Read! Copyright Michael J. Plagens, page created 11 May 2014.